The BRAT Charge Controller sold individually or in packs of 10. Four LED's for Bulk, Float, Load On and Low Battery. Patterned blinking LED's provide feedback about fault conditions. A unique feature of the Brat is the load circuit. This versatile feature can be used for many purposes including running well pumps, electric fences, or billboard lights in remote areas. 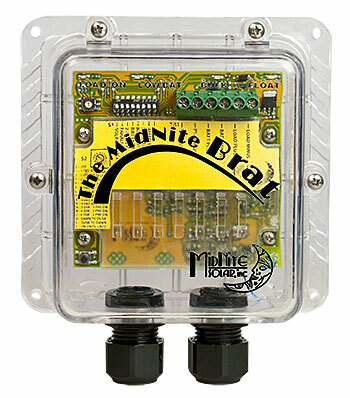 The Brat sports a highly customizable 16 position rotary switch lighting controller. We understand space can be a struggle in a boat or RV. With that in mind we kept the physical design of the Brat compact without sacrificing performance. All Brats are weather proof, sealed in a clear UV stabilized polycarbonate housing! (Type 3R/IP55). Replaces eleven of the industriesâ€™ leading controllers with just one model. Description: The BRAT Charge Controller sold individually ($125.00) or in packs of 10 ($1190.00). The Brat is simply the most versatile solar controller in its class. The Brat is a finely-tuned solar PWM charger capable of providing up to 30 Amps of charging current, with class-leading lighting and load control features including one-of-a-kind Solar Clock. Rain-proof out of the box, and supporting dead-battery charging and low-voltage load disconnect, The Brat is perfect for outdoor, marine, RV, and unattended remote applications. The Brat doesn't skimp on features, including temperature-compensated charging, manual and 30-day automatic equalize, and at an affordable price too! Gray aluminum type 3R rainproof enclosure with deadfront, will accept three 150VDC (MNEPV) breakers or two 600 VDC fuse holders. (Midnite Short Busbar) Shorter version of the insulated bus bars. These are useful for PV+ input on the narrow OB E-Panel and for a separate PV- bus bar for charge controllers that require them. 180 amps. Four #6 and two 1/0 wire slots. MNSBBN - 2.3" long. Two 1/0 & four #6 wire slots. 180 amps. Comes with mounting screw& nut #10-32 x 7/8". Made in USA, NRTL recognized. General use powder coated aluminum enclosure for retrofits, small inverter disconnect, PV disconnect, AC or DC distribution. General use enclosure - holds up to 4 13mm wide din rail breakers from 1-63 amps. General use aluminum enclosure for 4 panel mount type breakers from 5 - 100 Amp.